Because of the delicate citric character and low alcohol content, Berliner weisse is the only sour beer that is best fresh. Unfortunately, I can’t get a hold of fresh Berliner weisse (at the moment at least), so I’ll have to put up with what I found on the shelf. Don’t fret, it ages well too. I don’t have any woodruff syrup so I’ll be tasting these straight. First off I’ll have Berliner Style Weisse from Bayerischer Bahnhof in Leipzig, Germany, producers of another northern German sour style, gose. The Berliner Style Weisse pours a very pale straw color, quite hazy, with a bit of creamy white head. The nose is very light. 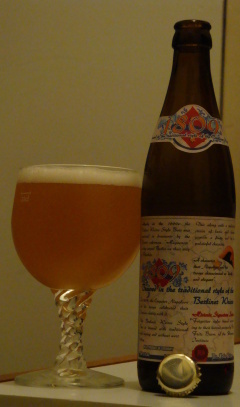 Somewhat tart, there is a citric character of lemons and grapefruit as well as a hint of flowery aroma. The taste is very delicate as well. The predominant flavor is lemon, but not so sour: much like a Meyer lemon. Wheat notes, tart, and somewhat sweet. There is also a lingering light bitterness. Lightly carbonated. Next up is 1809. This is brewed by Dr. Fritz Briem, Technology Director of (my alma mater) Doemens Academy. It is my understanding that it is produced at Brauerei Weihenstephan, widely considered the oldest operating brewery in the world. 1809 is named for the year in which Napoleon’s troops are supposed to have named Berliner weisse the “Champagne of the North”. The 1809 pours an opal straw that is not quite as pale as the Berliner Style. The head, a bit thicker and creamier, lasts a while but eventually fades to nothing. The nose is very delicate, milder even than the Bayerischer. I can barely detect whiffs of lemon, lime, and apple blossom. As it opens up wheat malt notes comes out. The taste as well is milder than the above. 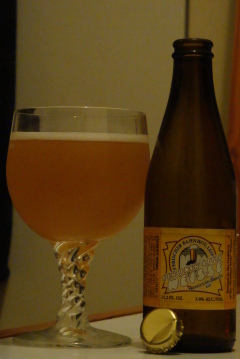 A gentle and aimless tart gives way to an ethereal wheat flavor, backed up by a bit of green apple and cider. This cidery character and a hint of sweetness linger, but the 1809 is very effervescent so it is quite refreshing.